It was indeed an honour and great pleasure to be invited to this very long established breed club show. 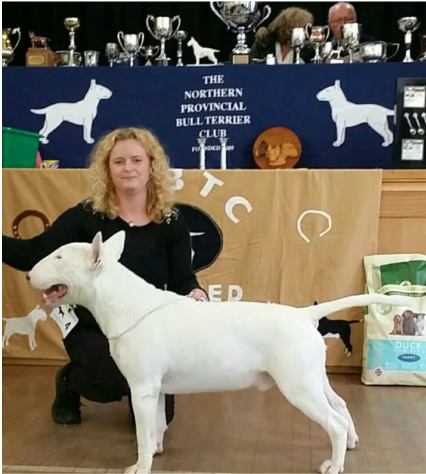 There were several dogs on view of excellent breed type, temperaments were first class throughout and the standard of handling was very good indeed. Good head and expression, well placed ears, nicely boned front, nice depth of body, sound topline, shapely quarters, put down in good order. Scored well in balance, good skull, very good eye and ear, good bite, nicely filled, good profile, good underjaw, well boned front, very good brisket, good neck and shoulder, sound backline, well developed quarters, well bodied, presented moved and handled with confidence. Promising of good type, well placed eye and ear, profile developing, good underjaw, clean neck and shoulder, very good topline, well bodied for age, quarters developing, put down in very good order, moved and handled with confidence. Good type, head of good make and shape, well placed eye and ear, sound bite, well boned front, sound backline, well shaped quarters, nicely bodied for age, needs to settle in the ring. Good feminine expression, head showing promise, well placed eye, sound neck and topline, clean well boned front, quarters maturing well, nicely bodied for age, moved with confidence. Good eye and ear, good bite, well filled, well boned front, good reach, well laid shoulder, sound backline, nicely shaped quarters, sound on the move both ways. Head of good type, well balanced, very good eye and ear, nicely filled, well boned straight front, nicely placed shoulder, sound topline, shapely quarters needs to settle on the move. Good breed type, good eye pigment and bite, straight well boned front, clean neck, very good topline, well bodied, well developed quarters, sound both ways. Good breed type, good eye, ear and bite, straight well boned front, clean neck, very good topline, good depth of body, well developed quarters, sound both ways. Good eye and ear, sound bite, nice profile, sound front, nice depth of brisket, good reach on to well laid shoulder, topline held on the move, well developed ample body, moved and handled very well both ways.